Puccini’s heroines and the rough treatment he hands out to them have come in for plenty of opprobrium over the years. But just occasionally they fight back on his behalf in the person of an outstanding singing actress; and this is exactly the case with Glyndebourne’s initial offering of their new season, a revival of Annilese Miskimmon’s Madama Butterfly, first seen as part of the company’s tour in 2016, and given a somewhat dusty reception on The Arts Desk. The production itself, in Nicky Shaw’s designs, seems not to have changed much. There remains the modish and apparently pointless update to the 1950s (in Nagasaki, for heaven’s sake!). There remains the self-defeating relocation of the first act to the agent Goro’s office, which makes nonsense of so many details in the scenario that one hardly knows where to begin listing them. There remain all kinds of lapel-clutching double underlinings of the otherwise (not so) easily missed anti-American subtext of the libretto, which both insult the audience’s intelligence and successfully undermine the real magic of Pinkerton’s (admittedly very temporary) passion for his little Japanese geisha (Olga Busoloc and Joshua Guerrero pictured below in the Act One duet). But this is where the superb Moldovan soprano Olga Busuioc comes in and, with the help of an excellent if not very assertive young American tenor, Joshua Guerrero, suddenly brings direction and shape to the Miskimmon “concept”. My wife asked, rhetorically: is Cio-Cio San a tragic figure? And too often the answer is: no, she’s just a passive #MeToo victim. 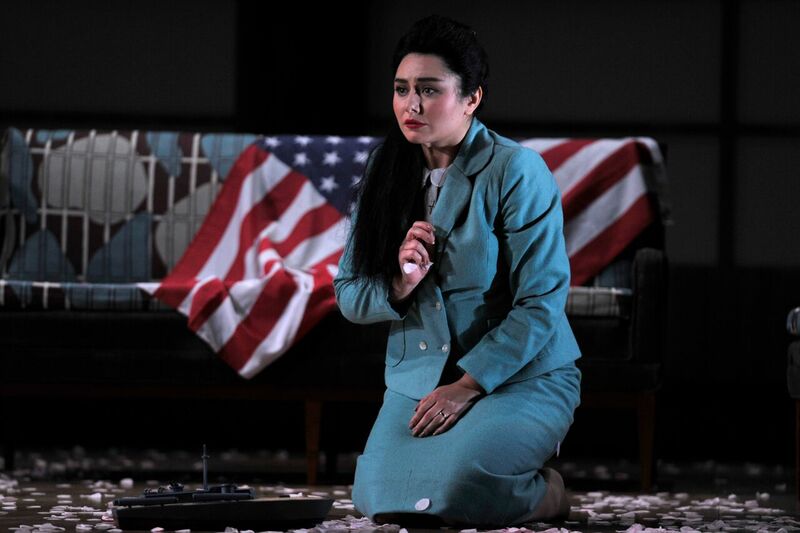 But Busuioc shows, in a performance of sustained dramatic intensity and vocal brilliance, that “povera Butterfly” is a figure who can grow in stature as she sheds her oriental passivity, is abandoned by friends and family and ridiculed by the Japanese agent (pimp?) whose sole aim was to sell her to the highest bidder. Whatever you think of Puccini as a tragedian, his mastery of his craft is beyond question. 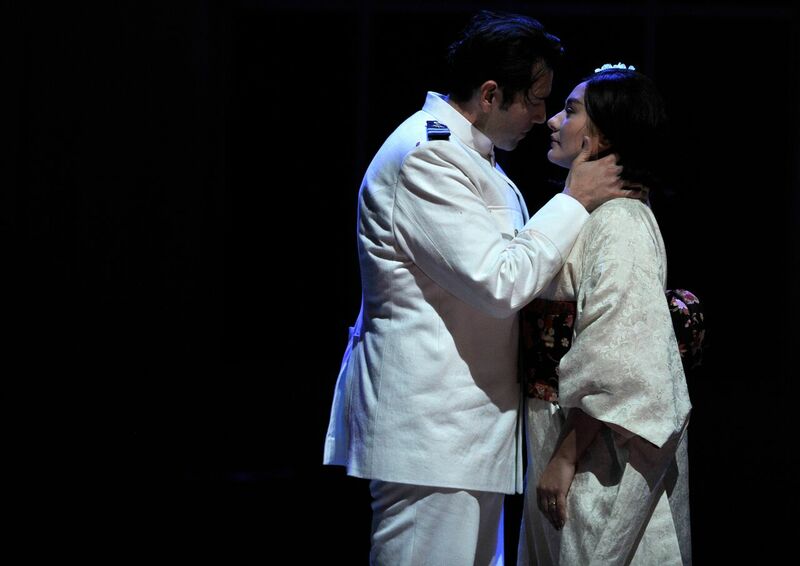 You can listen to the orchestration of Madama Butterfly and marvel at its precision and delicacy. Omer Meir Wellber draws consistently refined, energetic playing from the London Philharmonic Orchestra, needing only, perhaps, to attend a shade more, now and then, to his singers. Which brings me back to the staging: annoying and perverse in many respects, but with something at its core that an exceptional cast proves able to bring out. Have just come from a performance and found it first class in every respect. The staging worked well. The blossom and petals were a nice tough. Butterfly though was not a geisha, should had the years to have trained as one.